How I came to be invited to ASU to hear President Obama's speech, how I heard it, and how I left the Sun Devil Stadium afterwards: A blog post in three acts. Our landlords and friends, Barbara and Peter, happen to work at Arizona State University. Since they are linguists, they pretty much always get the job of reading the names of graduates. This is more of a challenge than you might think, as increasing numbers of students who are not of Northern European ancestry graduate. 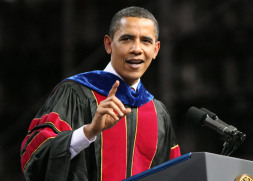 This particular year, President Barack Obama was invited to be the commencement speaker. This would be his first commencement speech for any university, at least as President; so it's kind of a big deal even if you are one of the one-in-five who isn't a fan of his. If you are a fan, it's a very big deal. Tickets to the commencement became an unusually valuable commodity. The graduates get a certain number of them, which normally go to close friends and family. The faculty get some. It's possible to request extras, at least in some cases. This year's commencement was to be the biggest ever, that is, with the largest ever number of graduates. And so it was to be held in the Sun Devil stadium, which "only" holds 71,000 people (including the graduates in folding chairs out in the field). That was therefore the top number of tickets that could be given out; and there was a mighty clamoring for them. My husband Michael's sister, Surya, may be Obama's biggest fan (next to Barbara). So Barbara made certain that Surya was offered one of the tickets that she, as name-caller, was given for guests. But Surya is person with a disability (the term she prefers) and uses a walker to get around; so Michael got a second ticket so he could act as Surya's caregiver. Then, because Barbara and Peter are totally sweet and didn't want me to feel left out, they got two more tickets, one for me and one, they suggested, for Michael's and my grandson, Zachary. At first, Zach was excited about going. Even though he is not quite ten, he is interested in politics. I explained to him that when I was his age, I had shaken hands with (then) Vice President Lyndon Johnson and I had remembered that moment all my life. But then the logistical instructions came in. We had to arrive at the stadium no later than 3 pm, even though the commencement wasn't to begin commencing until 7 pm. The stadium is open air and the daytime temperature would be over 100°. We might have to stand in line for an hour or two as we cleared security. We could not bring food or drinks into the stadium (though there was supposed to be free water, and food for sale, inside). Zachary thought he could handle all that if he could bring a couple of toys with him to occupy his time while he waited. The deal-breaker was that he couldn't bring a toy AK-47, or knife, or bow-and-arrow, or even ninja nunchuks. And so, at almost the last moment, he decided not to go. Leaving me with an incredibly precious ticket to the event, potentially unused. I had posted on Facebook that I was going. One of my Facebook friends saw the post and, perhaps jokingly, asked if I had any spares, as her son, who had just completed his freshman year at ASU and really wanted to hear President Obama speak, had been unable to get one. So I offered it to him, and he accepted it gratefully. Peter recommended we park at one of the lots associated with the newly-opened light rail system, since parking at the stadium is very limited and the light rail goes right by there. So that's what Michael and I did. It was our first ride on the new system and was easy to figure out. Parking was free. The ticket vendor would not accept my debit VISA card but did accept Michael's bank card; we got two all-day passes for a total of $5. We boarded at the eastern terminus of the line. There was plenty of room at first. But once the train began its journey westward, more and more people boarded at every stop. When a lady with a cane showed up, Michael gallantly offered her my seat. We got off at the Veteran's Way stop, which is nearest the stadium. Greg, my friend's son, and I had been in cell phone contact and he met us there. Barbara, Peter and Surya were already in the area and, again thanks to cell phones, we met them as well. The vast majority of the 71,000 ticket holders would be entering the stadium through the Northeast gate. However, as name-callers, Barbara and Peter and their guests (us) were able to use the "staff" entrance at the Southwest gate. There was no line there and no waiting. There was also no preparation for guests with disabilities. It's hard to see how the presence of people who have difficulty walking could be a surprise at a university facility in this day and age, but somehow it was. We were directed to one elevator then another; down one hall and then back to the elevator. Finally, after about twenty minutes, we located someone who put us into an electric cart and drove us to the Loge Level where our seats were. Michael and Surya had seats next to each other in section 115, but Greg and I did not. Greg was in section 116 and I was in 117. The good news was that all our seats were in the shade. The bad, of course, was that we'd be sitting separately. Greg found his seat right away, but since no one else had yet arrived in section 115, I decided to hang out there until someone came to claim the seat I was in. After all, I could always retreat to my assigned place. The stadium was filling quickly. It was blisteringly hot, and Surya asked if I would get her a bottle of the free water we'd been told was there. However, no one knew where that might be. All the concessions were selling bottles of water for $5.50. I didn't have the cash so we did without. I couldn't even find a water fountain. We nursed the bottles we had (I had bought one with my last change and Barbara had bought Surya and Michael each a bottle) and prayed for sunset. I had thought we would be twiddling our thumbs until 7 pm, but ASU had plans to entertain us. Starting at 4 pm, shortly after we had taken our seats, performers began doing their acts on a stage just to the right of the main platform. The first act was a group of Japanese precision drummers. Then came a mariachi band, and a group of guys doing a South American ritualistic military maneuver followed by an a cappella girl choir. We couldn't actually see any of these people directly. We'd have needed the optics of the Hubble telescope to do so. But there were giant TV screens all over, and small ones near us, from any of which we could view the acts. One screen was partially behind the performance stage. And with my camera on maximum telephoto, I could get some pictures. There was one screen that annoyed me, however. Most of the screens were of the traditional 4:3 TV screen ratio. But this one was a wide-screen, something like 16:1. Why did that annoy me? Because it was set to stretch the 4:3 image! I hate that! And I bet, if the brilliantly talented lead singer of the gospel group had seen what she looked like on the wide-screen monitor, she would have hated it too. The big entertainment draw, however, was Dash Cooper's band, with "special guest" Alice Cooper (Dash's father). The band sang three songs and then Alice came out to sing his hit "School's Out" with its oddly anarchistic words (blowing up the school is one of the concepts presented) which stood out all the more considering the security screening we had just been through. After the Coopers' performances, the entertainment portion of the day was completed and the parade of graduates, faculty, and alumni to their seats in the middle of the field took place. This had perhaps been timed so that the field was in the shadow of the western half of the stadium and therefore not quite so hot. Meanwhile, no one had yet challenged my seat and in fact section 115 was almost empty—the only such section I could see. I found Greg and invited him to sit with us if he wished, since there seemed to be room; he did so. Then a hush came over the crowd. Although he was too far away to see with the naked eye, the TV screens showed that the President of the United States had joined the rest of the "platform party" (including Barbara and Peter) on the main stage. 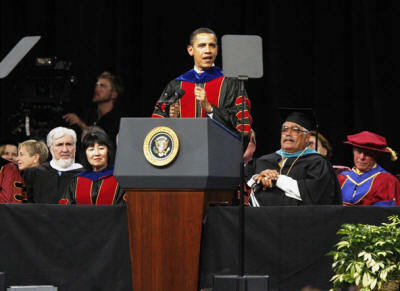 Presidents often speak at the commencements of major universities. And it is common for those universities to present those presidents with honorary degrees when they do so. However, a media controversy arose when ASU announced that it would not be giving Obama an honorary degree when he gave his speech, despite having previously given honorary degrees to Barry Goldwater, an Arizona senator, and Blake Edwards, Julie Andrews' husband and the director of Victor/Victoria. However, neither Goldwater not Edwards had recently defeated Arizona candidate for President Senator John McCain. In recent years, we have determined not to give honorary degrees to sitting politicians or major donors, but to do so based on an individual's body of work. While President Obama has already achieved remarkable success—including becoming the first African-American president—his greatest work is yet to come. …suggesting that ASU has higher hopes for Obama than they did for Goldwater (who failed to win the Presidency for himself) or Edwards (whose movies after Victor/Victoria included Son of the Pink Panther and Skin Deep, both of which failed miserably at the box office). I'd like to clear the air about that little controversy everyone was talking about a few weeks back. I have to tell you, I really thought it was much ado about nothing, although I think we all learned an important lesson. I learned to never again pick another team over the Sun Devils in my NCAA bracket. And your university president and Board of Regents will soon learn all about being audited by the IRS. The audience broke up, howling with laughter, not only at Obama's joke but at university president Michael Crow's look of abject terror, enlarged 1000 times on each of the many television screens in the stadium. I suggest the IRS might want to take the hint; there may be something there to find. Arizona governor Jan Brewer was also present. She hadn't exactly been invited; but as governor she is the honorary head of the Board of Regents so she simply invited herself. As a close friend of John McCain's and one of his biggest supporters, Brewer had never had anything good to say about Obama in the past. Now, however, she managed to sit next to him on stage. Even so, she was the only person in the stadium to not applaud when President Obama expressed his gratitude to Brewer's previous boss, former Arizona State governor and present Homeland Security head Janet Napolitano. Instead, every time the camera flashed her way I was struck by her expression, which was one you'd expect to see on a person who had taken a laxative a couple of hours previously and it was just now starting to work. As much fun as all this was, however, it took a far back seat to the content of Obama's speech, which was eloquent and moving. He (or his speechwriter) had taken the whole "body of work" concept and used it as the theme of the speech, applied to each of us (and especially, of course, the students). It may be tempting to fall back on the formulas for success that have dominated these recent years. Many of you have been taught to chase after the usual brass rings: being on this "who's who" list or that top 100 list; how much money you make and how big your corner office is; whether you have a fancy enough title or a nice enough car. You can take that road—and it may work for some of you. But at this difficult time, let me suggest that such an approach won't get you where you want to go; that in fact, the elevation of appearance over substance, celebrity over character, short-term gain over lasting achievement is precisely what your generation needs to help end. Find someone to be successful for. Rise to their hopes and their needs. As you think about life after graduation, as you look in the mirror tonight, you may see somebody with no idea what to do with their life. But a troubled child might look at you and see a mentor. A homebound senior citizen might see a lifeline. The folks at your local homeless shelter might see a friend. None of them care how much money is in your bank account, or whether you're important at work, or famous around town—they just know that you're someone who cares, someone who makes a difference in their lives. That is what building a body of work is all about: It's about the daily labor, the many individual acts, the choices large and small that add up to a lasting legacy. It's about not being satisfied with the latest achievement, the latest gold star—because one thing I know about a body of work is that it's never finished. It's cumulative; it deepens and expands with each day that you give your best, and give back, and contribute to the life of this nation. The audience was riveted; yes, of course it's likely that Obama didn't personally write the speech. But his delivery of it was flawless and moving and it was clear that the words accurately conveyed his own ideas. Moreover, there wasn't a single person among the 70,000+ present who didn't find those ideas inspiring. I know starting your careers in troubled times is a challenge. But it is also a privilege. Because it is moments like these that force us to try harder, to dig deeper, to discover gifts we never knew we had—to find the greatness that lies within each of us. So don't ever shy away from that endeavor. Don't ever stop adding to your body of work. I can promise that you will be the better for that continued effort, as will this nation that we all love. All 70,000 people rose as one; the ovation was thunderous and prolonged. Greg made his goodbyes and left, as many others in the audience did. And I figured, the President would duck out now that his speech was over. But he didn't. 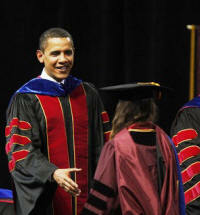 The next part of the ceremony was the presentation of diplomas to the doctorate and masters graduates; and, along with ASU president Crow, President Obama shook hands with every single one of them. And, interestingly, a number of the female students apparently asked if they could hug him; he reached out to them and they got their hugs. I kept hoping one of the guy students would do the same thing but they were trying too hard to look cool. But you could tell they wanted to. And the President never looked harried or hurried. He was completely focused in the moment. Finally, the ceremony concluded. The platform party, including the President, retired and a short fireworks display began. Barbara tells us the President was whisked away; she'd been five feet from him but, not being one of tonight's graduates, had been unable to shake his hand. Now it was time to leave. But that was to prove problematic. I looked for the young man who had driven us in his electric cart to the Loge Level, but there was no sign of him. So Michael asked a fellow who had been manning the gate to our section for assistance. But the guy just said there were no carts, and we would have to walk down. Surya was not the only person with a disability there. There were two other women, grandmothers of the same student, who were also unable to walk without assistance. One had a cane and the other had two recently-replaced knees and a pin in her elbow. As our concern mounted, we were visited by more employees: ushers, security guards, managers. It was clear none of them had been prepared for the presence of less-than-able persons in any way, and had no solution for how these women were to get downstairs. When Surya pointed out that she had been brought upstairs by electric cart, and why not go down the same way, the man she spoke to said that carts were not permitted on the Loge Level. Surya heard this as being told she was lying (which in essence was what he'd implied), and hit the roof. I called Barbara and Michael called Peter, knowing they were in the company of the school bigwigs and might be able to light a fire under one of them. After nearly an hour of our trying to explain that the ladies could not "just walk down", Ronald Hudson, a manager, arrived with an electric cart. We got the two grandmothers into it, and Michael helped Surya raise her leg high enough to slide into the front seat—the cart would certainly be better than trying to walk, but it wasn't really designed to aid the persons with disabilities either. We fastened all their seat belts, and Ronald got in to drive them downstairs…and the cart froze, its battery dead. Apparently no one had instructed anyone to recharge the cart batteries in the hours between our arrival and departure. Ronald ran off to try and find another, working, cart. Michael suggested we just plug this one in. I pointed out it would take at least twenty minutes to charge the battery. Michael pointed out that, for all we knew, Ronald would be gone that long. The son of one of the grandmothers jokingly suggested we push the cart to the edge of the ramp going downstairs and let gravity do the rest. But Ronald came back within five minutes with a second cart. We transferred the ladies into it and he drove them off. A smaller cart appeared and Michael and I were given a ride in it to meet Surya. By then, Peter had commandeered a cart but when he met us we were already downstairs. Peter drove Surya and me to the nearby IHOP while Michael and Barbara walked. The place was mobbed and understaffed. Our dinner order was misplaced and it was two hours before we were out of there. Still, not even that could spoil the excitement of the evening. President Obama's speech can be read in its entirety, or watched and heard on video. The magic of being there, for me, was being part of a crowd that, like me, had gone through so many years of being bereft of hope. And now, having listened to this man's words, his quiet eloquence and confidence that so contradict the naysayers' frightened lies—we began to feel, for the first time in too long, that there was, at last, cause to hope: Hope for the future of the next generation, but also for ourselves, that we might all be able to survive the multiple disasters of the past few decades and actually turn things around for the better.